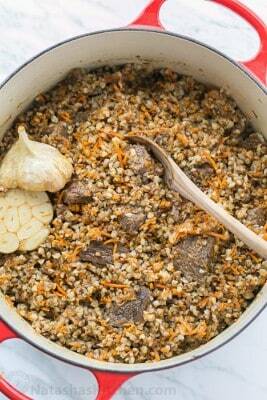 This buckwheat and beef pilaf is a play on traditional rice plov. Set a large heavy-bottomed stock pot or dutch oven over medium/high heat and add 1/3 cup olive oil and 4 Tbsp butter. Add onion and sauté, stirring occasionally until softened (about 5 min). Add cubed beef and sauté 5 min, turning once (beef will not be fully cooked). Add julienned carrots and stir another minute. Add 4 1/4 cups cold water and season with 1 tsp cumin, 2 tsp salt and 1/4 tsp pepper or to taste. Bring to a boil then reduce heat to a low simmer, cover and cook 1 hour. Meanwhile (about 10 min before your timer is up), heat a large non-stick skillet over medium/high heat and melt in 4 Tbsp butter. Add 2 1/2 cups buckwheat and toast until golden, stirring often (3-5 min). Pour buckwheat into the pot in an even layer and gently pour enough hot water to cover buckwheat 1/2" above the level of the buckwheat (I added 1 cup hot water). Cut garlic head in half parallel to the base to expose cloves and place over the top of buckwheat, cut-sides-down, pushing into the buckwheat slightly. Cook uncovered over med heat until most of the surface liquid boils out (10 min). Poke 8-10 holes through the buckwheat to allow steam to escape to the surface, then cover with lid, reduce heat to the lowest setting and let pot sit another 30 minutes. Remove garlic and stir everything gently to combine. P.S. you can squeeze garlic cloves out of their skins and serve them in the pilaf if you wish.